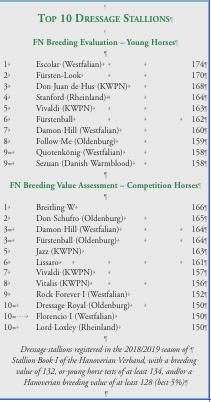 The German FN breeding values have been released, again in the new format of one set of standings based on open competition results, and one on the young horse classes. I suppose there is nothing like a young horse to head the young dressage horse values. So the 2017 Nürnberger Burg-Pokal winner, Escolar (Estobar NRW x Fürst Piccolo) heads up the 2018 German FN values with a value of 174, but with a relatively low reliability figure of 90%. Once again, I draw on my friend Thomas Hartwig and his encyclopaedic knowledge of Westfalian breeding: “We have seen in the last two or three years a very interesting comeback of the famous E line. The founder of the E line in Westfalia was Ehrenschild (Eindruck II x Adlerschild), a stallion from the Hanoverian State Stud in Celle, who came in 1960 to the town of Melle which is right on the border of Westfalia and Hanover, and the Westfalian breeders used him. He was a big, heavy horse but typical of his time, remember he was born in 1956 and came to Melle in 1960 – for this time he was a typical horse. “He sired the Westfalian stallion, Ehrensold (Fronvogt), whose son was the very famous Ehrentusch (Rheingold). We saw a lot of very good children of Ehrentusch, and a lot of them have the same characteristics, they all want to work, they all had very good hind legs. 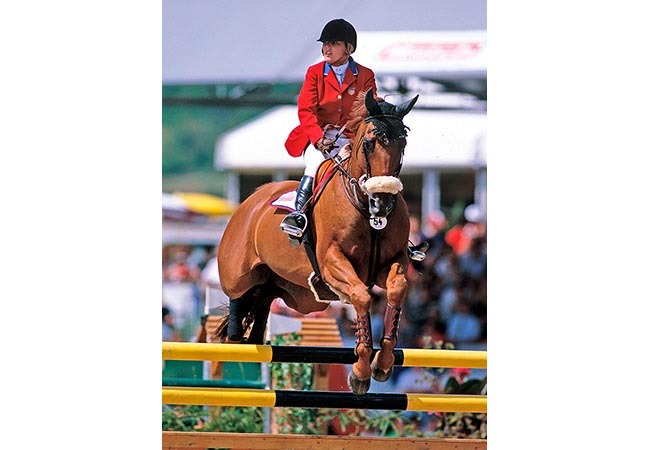 They were not beauty queens, or kings, but perfectly usable, and not only dressage horses but also showjumpers. You might remember El Paso from Paul Schockemöhle and later Eddie Macken. In the 80s and early 90s, Ehrentusch was very favoured but then a lot of people said, ‘Oh! Ehrentusch’s children, are not beautiful enough’, and his popularity slipped down. “Then one of the most famous breeders, Norbert Borgmann, the father of Stephen who runs the stud today, used Ehrentusch with his very perfect mare, Florance (Ferragamo x Florestan), and produced Estobar, later Estobar NRW. He sold at the auction in 2006 for the unbelievable price of over half a million euros. “From Estobar we saw his really best son, Escolar, two times a winner at the Bundeschampionate as a three- and four-year-old stallion where he received several tens for gallop and trot. Now we can see the first children of Escolar. The oldest are four, but in the first season he covered only a handful of mares. The first crop we can really see are the three year olds and they have had a lot of success in Westfalia, and in the Bundeschampionate. The champion of the three years old geldings and mares is an Escolar – Eternity – who was shown by the stable of Andreas Helgstrand. Since his win in the Burg-Pokal, Escolar has gone on to commence a very promising Grand Prix career. In November of this year, Hubertus Schmidt and Escolar won the Munich Indoor four-star CDI Grand Prix Friday in the stallion’s Big Tour debut, a day after riding the horse’s younger brother, Escorial, to victory in his first international Grand Prix at the same competition. Schmidt and Escolar scored 75.435% for victory in the Grand Prix Special. Don Juan de Hus (Jazz x Krack C) comes in third on 168. The stallion was sixth at the 2013 WBCYH, but 'hoof cracks' prevented his GP debut. He died in 2017, but not before he sired a couple of young horse stars. His son, Don Martillo (Benetton Dream FRH) won the five-year-old WBCYH in 2017, but seems to have disappeared since then. Another son, d'Avie (Londonderry) won the six-year-old championship the following year, but also seems to have disappeared, while the interestingly bred, Dorien Grey de Hus (out of a Poetin clone) placed fifth in the five-year-old age group. Previous articleMale or female? What would you choose?